Twitter is a fantastic tool for website owners as it allows you to send an update to followers and announce your latest articles. By integrating Twitter into other marketing avenue, any company can easily increase its revenue. But, using Twitter for marketing your website and its good or services can be time consuming and tedious. Today’s post we have compiled a list of some of the best free Twitter feed wordpress plugins for your wordpress blogs. This post focuses on some of the most useful plugins to help WordPress users get the most out of Twitter in their blogs. You can also use Twitter to promote offers, share other interesting articles, network with fellow website owners, and connect with your audience. If you like this article, you might be interested in some of our other articles on: Modern Minimal Web Design Examples, Free Dictionary Plugins for WordPress, Free WordPress WooCommerce Themes and Amazing Calendar Design Ideas 2014. Hassle-free and user-friendly way to add a Twitter Feed to your website. Get started in just a few clicks without the need to setup your own Twitter App. A Widget that uses jQuery (if you want) and Twitter to fade in and display a user’s tweets one at a time, then fades into the next. You can set the amount of tweets and how long they stay before they fade into the next tweet. This is a plugin to embed the twitter feed to your site in a very easily way with many options to customize the twitter feed box. Embed anyone’s Twitter Timeline using only their username, or display tweets based on a keyword. Fully compatible with the latest Twitter API and guaranteed to work even with the forthcoming twitter changes! 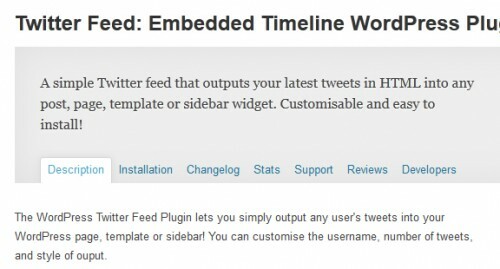 The Widget Twitter plugin lets you to fully integrate your WordPress site with your Twitter account. Users will be able to stay tuned to your Twitter page through your website. TweetScroll is widget that displays latest tweets from you Twitter account using new oAuth API 1.1. This simple widget can be used in any website/blog. The Gabfire Widget Pack is a feature-packed plugin that adds the most commonly used widgets to your site. Rather than having to download several plugins by various authors, this plugin bundles together the most popular widgets. This plugin displays the latest posts from a Twitter account in a sidebar widget. Twitter API 1.1 ready, with easy customization of number of posts shown and replies detection. The WordPress Twitter Feed Plugin lets you simply output any user’s tweets into your WordPress page, template or sidebar! You can customise the username, number of tweets, and style of ouput.